Depending on the design and layout of your home, rainwater may provide all of the cleaning your stucco needs. Roof overhangs and landscape plants, however, sometimes create areas that rain can't reach. Mud stains are common on the bottoms of exterior walls, and shaded areas may develop mildew stains. In humid regions, algae has been known to grow on stucco as well. Fortunately, all of these stucco stains can be removed with a garden hose, homemade cleanser and a little manual labor. Examine the stucco for chips or cracks. 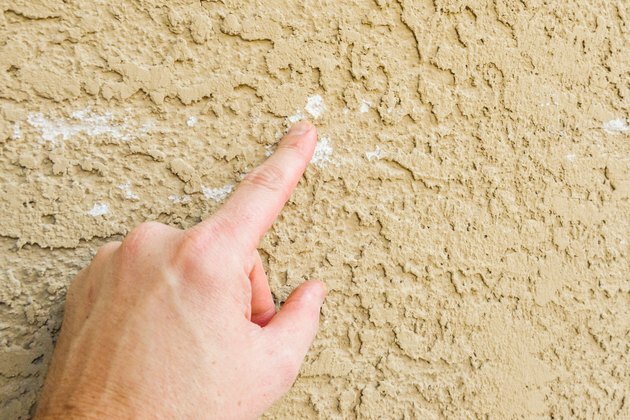 If you find any, repair them yourself or have them professionally repaired before washing the stucco. 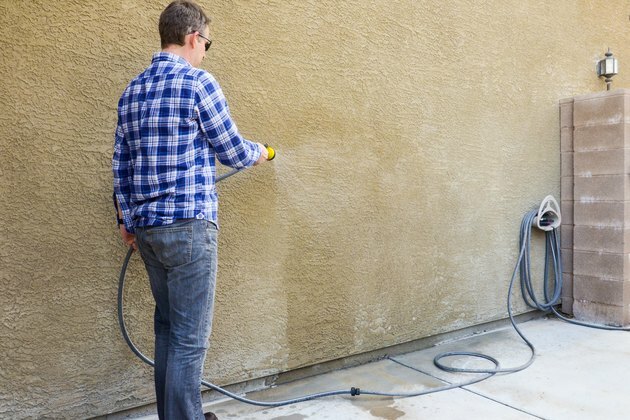 Spray the wall you wish to clean with water from your garden hose, starting at the bottom and working your way up. 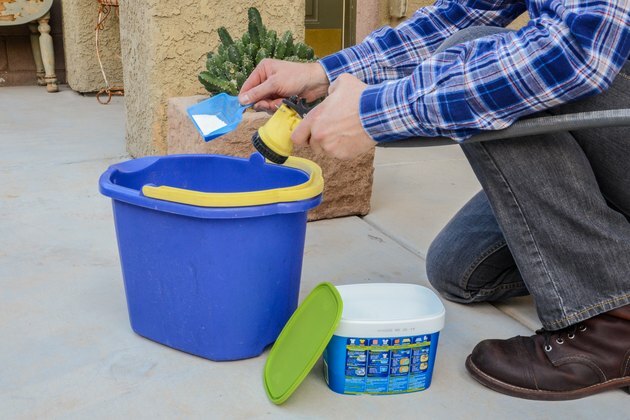 This removes surface soil and ensures that the wall won't absorb any dirty water that runs down from the top of the wall during cleaning. If the wall isn't stained, this may be enough to regain your wall's sparkle. Prepare a cleaning solution that is one part oxygenated bleach powder and 10 parts water in bucket. 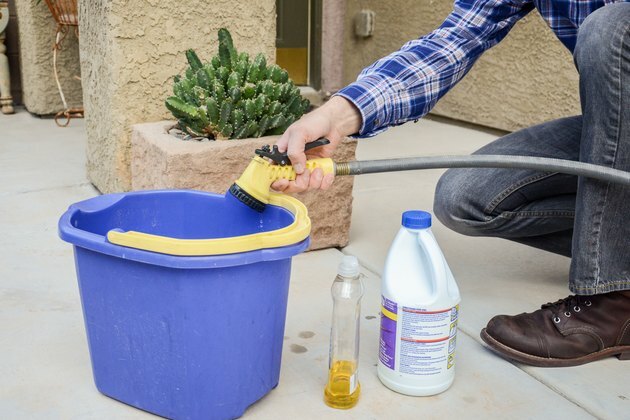 Add a squirt of liquid dish soap to the mix and place the cleaning solution in a garden sprayer. If the directions on your bleach recommend a different water-to-bleach ratio, follow the product manufacturer's instructions. Spray the wall with the cleaning solution, again starting at the ground and working your way up. 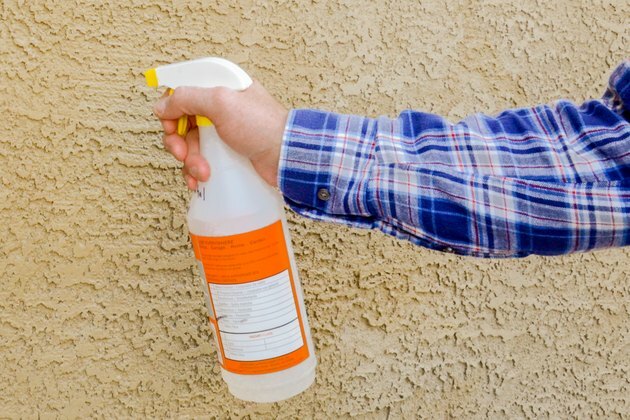 Use a back and forth motion as you spray to ensure thorough wall coverage. Scrub any stains you notice as you clean with a scrub brush dipped in your cleaning solution. 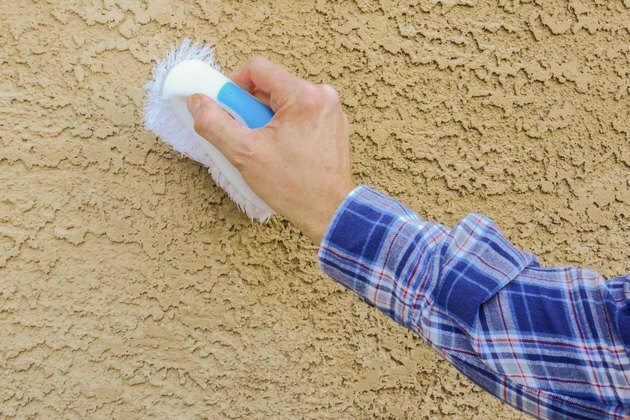 Work quickly, as you should leave the cleaning solution on the stucco for no more than 30 minutes. Rinse the stucco thoroughly with your garden hose, this time starting at the top and working your way down the wall. Make a paste by adding a powdered laundry detergent that contains trisodium phosphate to water. Apply the paste to any remaining stains with a scrub brush and rinse thoroughly. 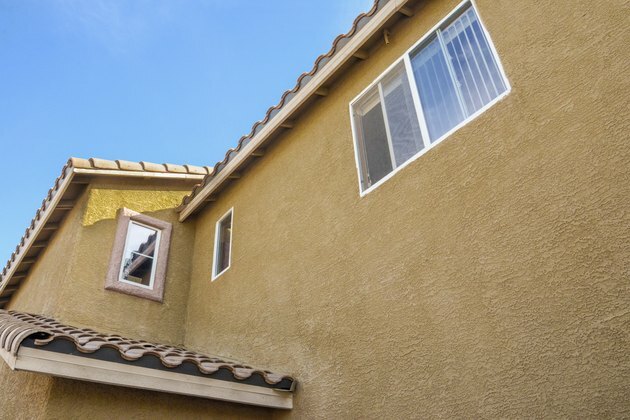 Remember to re-soak the stucco below the stain with water before treating.